Kolkata: Turnstone Global, one of the oldest Non-Governmental Organisation serving the underprivileged and needy for more than a period of 20 years today organized the Conclave “ULLAS 2017” and launched “ULLAS” – Project on Women Empowerment in tune with the development agenda of the Government at Mahajati Sadan in Kolkata. The event was inaugurated by Justice Shyamal Kumar Sen, Former Governor, West Bengal, Former Chief Justice, Allahabad High Court, who was also the Chief Guest. Several eminent personalities and State Ministers also graced the event. Dr. Sonali Chakravarti Banerjee, Vice Chancellor, University of Calcutta; Dr. Anuradha Lohia, Vice-Chancellor, Presidency University; Dr. Soma Bandyopadhyay, Director, IISWBM and Dr. Mohua Das, President, WBCHSE were the Guests of Honor while Sri Churamani Mahato, Minister-in-charge, Backward Classes Welfare, GoWB was present as Special Guest. Project “ULLAS”, launched at the Conclave “ULLAS 2017” is one more endeavour from Turnstone Global poised at beginning a new era on Women Empowerment. The project commits to provide skill and entrepreneurship development to 50,000 girls in the state of age 18 years and above, helping them to become self-reliant either through formation of self-help groups or by providing employment in different industries in next five years. To mark the beginning of the project, 10,000 girls, selected for the first year skill development, were felicitated today at the event. “Our organisation was formed initially with a strong mission of helping the physically challenged and disabled with means to stand on their own feet. Thereafter, our scale of operations have expanded to all other sectors of social, economic and environmental development, enabling us to touch the lives of more than nine thousand beneficiaries directly and approximately six lakhs indirectly so forth. Our decade’s long experience in education, health care, skill development, cultural development, training management, rehabilitation, human rights, child rights, women empowerment, care for the aged and blind, sustainable agriculture and environmental sustainability, etc. has earned benevolent support and appreciation from different strata of the society. The KANYASREE project of the Government of West Bengal has paved way to end this discrimination. Now the PROJECT ULLAS will further enhance to end this discrimination and deprivation,” Dr. Gaba further added. On the occasion, Turnstone Global honored 30 successful woman achievers from different fields like Art & Culture, Public Administration, Industrial and Corporate Leaders, etc. with “ANUPAMA SAMMAN” as an acknowledgement of their achievement. 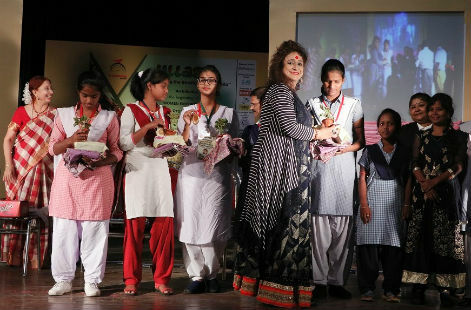 Among the winners were – Dr. Manabi Bandyopadhyay, first transgender to be Principal of Krisnagar Women’s College; Sohini Sengupta, Film & Theatre Actress; Poulami Ghatak, National Table Tennis Champion; Alokananda Roy, eminent danseuse; Amita Dutt, eminent Kathak dancer; Sharbari Datta, eminent Fashion Designer; Bratati Bandhopadhyay, elocutionist; Krishna Basu, poetess; Pallavi P. Kaul, Managing Director, NICCO Ventures Ltd; Subhashini Mistry, Social Activist; Neeloo Sherpa, IPS, DCDD, Kolkata Police and other eminent women personalities. In addition, 2,000 children beneficiaries of Turnstone Global including 500 blind children were presented new clothes as puja gifts at the event since the event preceded the largest festival of Bengal. At the event, beneficiary children of Turnstone Global presented cultural performance.